The Burrito Bash kicked off a bit earlier than expected, as I was able to locate a burrito outlet in Dulles Airport in Washington D.C. during my layover. One could say the Bash started on Thursday with my purchase of a burrito from the Mc Neil room, but it was more of an precursor, an exhibition burrito so-to-speak. Irregardless (my favorite non-word word), here’s the first entry in my Burrito Log, or BLog for short. Damn, BLog is such a cool word! AND STOP AUTOCORRECTING ME, WORD—I know the L is capitalized. Initial impressions: Immediately, I was skeptical of the name, especially given that Washington D.C. is not located in California. However, my fears were assuaged when I arrived at gate C22 and took a gander at the menu. This wasn’t your typical crappy airport place, this was a Mexican chain with an airport franchise. They had a good variety of traditional favorites and unique specials. Ordering: My clerk spoke English fairly clearly. After ordering the burrito, she asked me if I wanted cheese and sour cream in it. I found this very responsible, as how else we should know if I wanted it vegan or just vegetarian. However, she then asked whether I wanted to upgrade to a combo, but I had trouble understanding this the first time. I then explained that I wanted chips with guac, and she explained to me that it was cheaper to get the combo, which included chips with salsa and a drink, then add the guac separately. I agreed to this proposition, selected my drink, and paid obediently. Waiting: There were 7 or 8 people standing near the counter waiting for food. I had been assigned #757. I was temporarily worried that I would have to be waiting for a while. Things progressed pretty rapidly, #755 was called almost immediately. #756 followed a minute later, then #758, then #757. I was very impressed with the speed of the construction of my burrito, and I believe the delay that caused #758 to cut was due to my chips and guac. The Unwrapping: I had to walk all the way down the C concourse to the D concourse (which annoyingly were in the same building, not really unique concourses at all. My mouth was watering with the thought of a good burrito. I sipped intently on my lemonade as I negotiated the throngs of people in Dulles. When I arrived at the waiting area, I set my belongings down, and peered inside the bag. On top was a stack of napkins (5 to be exact) with the phrase “IT’S A PARTY IN THAT DISPENSER, LET ME TELL YOU”. I was initially boggled by the use of the word “dispenser”. What was this dispenser they were referring to? Is a styrofoam clamshell carton considered a “dispenser”? I suspended my disbelief, and read the smaller text below, “If you’re having a party outside of this dispenser, call us to cater it or go to californiatortilla.com.” Hmm, so maybe the whole bag is a dispenser? Then it clicked. I was supposed to have removed the napkin from a napkin dispenser. However, the placement of the napkin in the bag without my interacting with said napkin dispenser ruined the effectiveness of this phrasing. Okay, enough with this dispenser nonsense. I noted that the side of guacamole was outside of the clamshell, and that there were no other items in the bag. 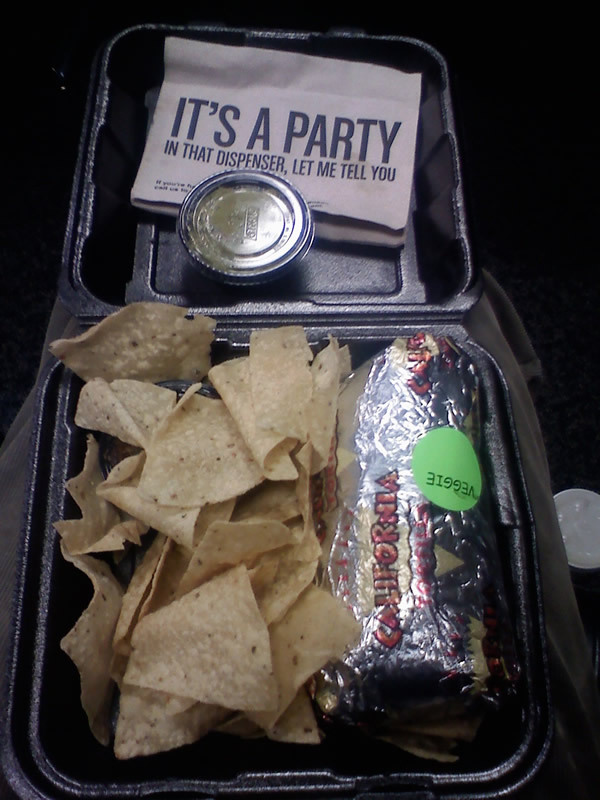 I opened the clamshell and was greeted with an assortment of tortilla chips, a black cup of salsa, and a rather large burrito wrapped in tin foil with a green “Veggie” sticker on it. I paused my explorations to take a quick photo. In order to make room for the burrito, I moved the chips into the top of the clamshell. 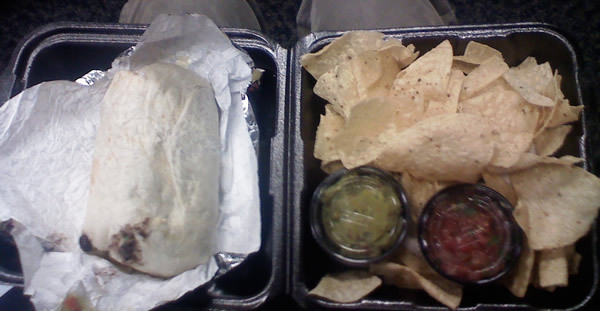 I then grasped the burrito, and began unwrapping. I was surprised that the foil was actually paper backed, meaning it ripped like paper rather than tin foil. Upon opening, I was quickly impressed by the scale of this burrito! While not very long, it had a massive radius. Briefly, I was worried that I would be unable to eat this burrito without the assistance of utensils. I paused once again to take a picture of the naked burrito. The First Bites: Perhaps I was simply famished, but the first couple bites were pure bliss. I encountered a large pocket of guacamole mixed with delicious, somewhat spicy, black beans. Yum, I thought, this is a lot like a Chipotle burrito! I continued taking healthy bites from my prey, encountering a mix of sour cream, Mexican rice, and black beans. Post Burrito: I turned to my other food items: chips with guacamole. At a glance, the chips looked bad—somewhat like your run-of-the-mill Tostitos chips. However, a closer look and taste revealed that they were quite tasty! The taste was equivalent to Baja Fresh chips, however, the texture was a bit more crunchy. Some chips showed uneven amounts of grease. The guacamole was quite good, as well. It was a bit saltier than my preferred guacamole; however it was not offensive to me in any way. It featured well ground avocado and small, cube sized chunks of tomato. I noted the lack of chunks of avocado, which dinged it a couple points in my scoring system. I finished the guacamole before I was half done eating my chips—proof it was pretty damn good. I didn’t touch the cup of salsa. I ended up not finishing the chips, as the meal filled me up. Closing thoughts: Things started out great, California Tortilla, then you betrayed me. The first half of the burrito was pure, unadulterated burrito bliss. But, why did you have to include the things! I hate things! Especially when things appear in my burritos that aren’t on the list of ingredients on the menu! And now some arbitrary ratings! OVERALL EXPERIENCE: 3.5/5 – Fast shipping, excellent seller, product not as described, might buy again. Ordering Experience: 4/5 – HABLAN INGLES! Y me ayudan mucho. This entry was posted on Saturday, March 7th, 2009 at 11:18 pm	and is filed under Fun. You can follow any responses to this entry through the RSS 2.0 feed. You can skip to the end and leave a response. Pinging is currently not allowed. My favorite part! I also like how you described the burrito size…very interesting.